BOMB FACTORY: Acoustic Gig Goes Well Shocker. Acoustic Gig Goes Well Shocker. Death At The Hairdressers; Blow It Up...; God Loves Us And He Hates You. (We ended this the traditional way - by forcing dirty feedback wailing from our battered gear). First time I'd been to CB2. There's a pricey eatery thing going on upstairs but downstairs lies the cellar for these low key gigs. Three singer-songwriters took to the stage before us -I think our favourite was Kristy Gallagher who came from Coventry to dish out some tunes using a refreshingly English accent. 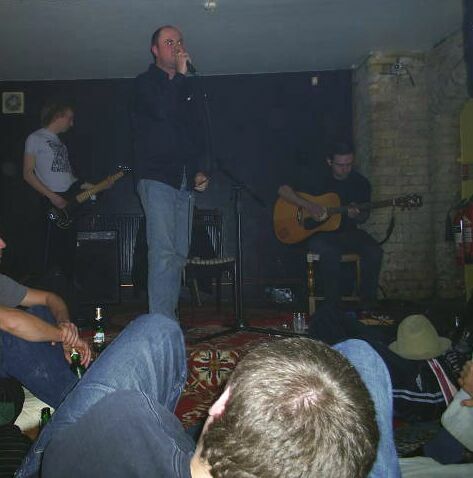 We may do another acoustic gig sometime; it was a good laugh and the songs do still manage to sound quite brutal. Jack's screaming may have something to do with this. However, our love of ear destroying noise will always mean the electric instument snapping set will be our first love. We have no desire to rebrand ourselves Folk Factory. If we ever do, you have permission to glass our faces. brilliant last night. so glad to have been there. whole new clarity to the poetry, delicacy to the no-nonsense bass&geetar. fan-bloody-tastic. damn my dial-up for being too slow to relive the moment. Wahey - just heard the whole set off your stream. Brilliant stuff.